We have over 3,000 positive reviews across different review sites. 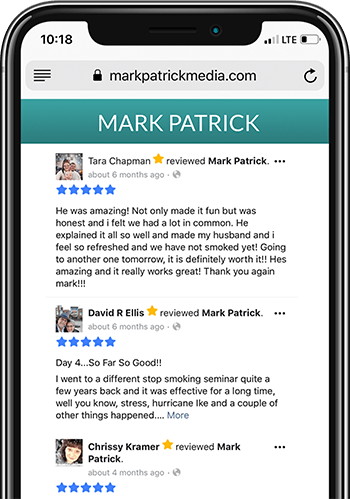 Read the reviews now to see what our clients are saying. Barbara Klingensmith Stopped Smoking After 42 Years! Listen below or read her review. Mark Robe Lost 10 Pounds! Listen below or read his review. Kaye Corey Lost 5 Pounds! Jill Meyer Stopped Smoking After 30 Years! Connor Riley Stopped Smoking After 5 Years! Georgia Petrakis Stopped Smoking After 42 Years! Register For A Mark Patrick Seminar Today!